Having quickly conquered most of Europe, the Nazi German army that arrived on the outskirts of the USSR’s capital in autumn of 1941 appeared to be an unstoppable war machine. It was the Soviet troops at the Battle of Moscow who shattered this illusion. In October 1941 Hitler launched an offensive on the Russian capital codenamed Operation Typhoon. It was supposed to crush Moscow in a so-called double pincer - two simultaneous attacks from the north and south. The Soviet troops vigorously fought back, disrupting Hitler’s plans for a quick operation. The Battle of Moscow eventually lasted through January 1942 and ended in the first battlefield defeat of the Nazi army. The battle was one of the bloodiest and lethal struggles in world history and was later considered to be a decisive turning point in the fight against Nazi troops. Memories of that battle are still fresh for WW2 veteran Gennady Drozdov, 98, who was assigned to the 4th Guards Mortar Regiment at that time. The weather seemed to be on the side of the Soviet army, as autumn brought heavy rains, and then winter caught the Nazis unawares with exceptionally freezing temperatures. While the epic battle raged on, Moscow residents had to “survive all the horrors of war: hunger, cold, devastation, loss of family and the loved ones,” according to Rimma Grachyova, who was seven years old when the war broke out. “We helped the front as much as we could. We’d collect scrap metal from courtyards. I’d knit socks and mittens together with grown-ups, as I knew how. We wrote letters too. We also sang for the wounded in hospitals,” the 80-year-old witness said, sharing her childhood experience. Almost one million Soviet soldiers died during the defense and counter-offensive operations, which included the construction of three defensive belts in the Moscow region, as well as deployment of reserve armies. 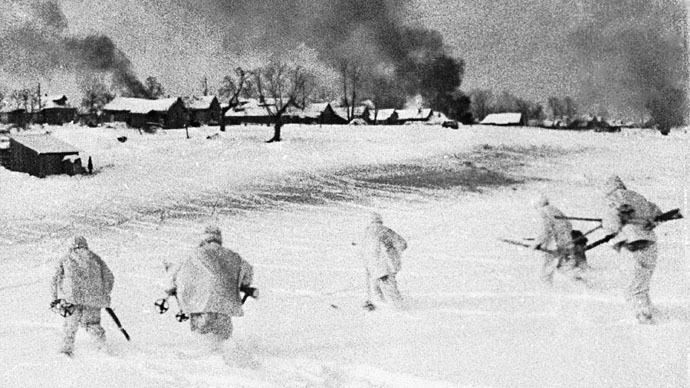 The outcome of the Battle of Moscow saw German troops pushed back nearly 200 km from the capital, becoming the first-ever blow to the Wehrmacht’s reputation as an invincible army.